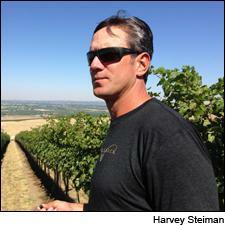 Doubleback's Drew Bledsoe surveys McQueen Vineyard. On a warm September afternoon, Drew Bledsoe stood in an acre of closely cropped grass. The ex-NFL star quarterback adjusted his sunglasses and surveyed the field, only he wasn't looking over a menacing defense but rows and rows of young grapevines. Their purple bunches of Cabernet Sauvignon stood out against close-cropped green canopies cascading down a steep north-facing slope. In the distance, buildings in the town of Walla Walla reflected the afternoon sun. Grapes from the 40-acre McQueen Vineyard form the heart of Bledsoe's Doubleback Cabernet Sauvignon, already achieving attention for their supple textures, rich flavors and deftly balanced intensity. Since 2007, its first vintage, Doubleback Cabernet Sauvignon, made under the watchful eye of consulting winemaker Chris Figgins of Leonetti Cellars, has proven to be a winner, earning a classic rating for the 2007 vintage. At 1,200 to 1,425 feet elevation, the north-facing slope plays against the warm climate in this southern Oregon-side portion of the Walla Walla AVA for "more acidity, better balance," said Bledsoe. He has two vineyards in an ambitious 2,000-acre vineyard development called Sevein, the latest project from the folks who planted Seven Hills and Pepper Bridge, two of Walla Walla's mainstays. Leonetti and L'Ecole No. 41 are among the owners. Leonetti has an experimental European-style terraced slope here, and another vineyard already showing promise for Aglianico and Tempranillo. Plans are to dig into the base of McQueen to build a winery in the form of an underground hall surrounded by the spokes of long tunnels for aging the wines. Work is scheduled to begin next year and be complete in time for the 2016 vintage. Bledsoe maneuvers his silver SUV through two other vineyards to get the other property, only a few Hail Mary passes away as the ball flies. The 9.7-acre Bob Healy vineyard has the same elevation and shallow gray silty soil as McQueen but the surface has more wrinkles in it. Earlier, in his spiffy tasting room in downtown Walla Walla, we tasted barrel samples of 2013s. Streaks of savory earth and black pepper run through the ripe cherry and currant flavors on McQueen's open texture. The Bob Healy shows more plushness and a mild grip of tannins around mouthfilling cherry and plum fruit. Both wines were drawn from neutral barrels so as not to show much of the oak character to be expected when new barrels are blended in. The quarterback who grew up in Walla Walla—there's even a statue made from mufflers at a local auto repair shop of him throwing a pass—now lives just 4 1/2 hours away, in Bend, Ore. The night before we met in Walla Walla he nervously watched his teenage son lead his high school football team to a victory. Although he seems just as edgy about how his latest vintage is showing, it looks like he's found a winning pattern.